Home Unlabelled They Have 213 Years Together- The Husband Is 108, The Wife 105, And They Celebrate 82 Years Of Marriage! They have been together for almost a generation. In November 1932 they got married, and the same very month Franklin D. Roosevelt was elected president. 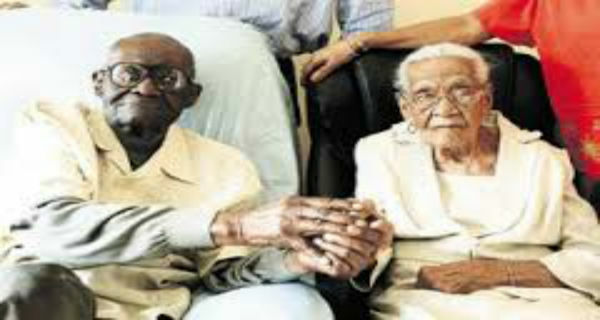 Duranord Veillard became 109 years in February while his dearly wife, Jeanne became 105 in May. They surely didn’t know that they would live this long and they would still be together. They are an example for many loving couples who one day wish to say their vows and walk down the isle with the person they want to spend the rest of their life. Duranord and Jeanne Veillard raised five children, they moved to the United States in 1968 after Duranord lost his job as a judge and was awarded a visa to visit the U.S. He settles in Spring Valley. What’s their secret for keeping the love and happiness in the marriage and being the calm happy family? Duranord is known as a good and honorable man, and as his son Vely Veillard who is 62 years old, says that at the ceremony he gave an interview to an reporter and wanted to tell him all about their memories because he remembers everything and even offered the reporter a piece of birthday cake which was frosted and crowned with the number 108. Jeanne Veillard wore a white linen dress with a pair of pink slippers, she sat nex to her husband and never let go of his hand. Every morning Veillard wakes up at 5 am and he does 5 to 7 pushups, takes a cup of tea, oatmeal and fresh fruit for breakfast and he is ready to start his day. Then for lunch and dinner would eat fish and fresh vegetables and will always sleep early and very often.